Lost Creek Mushroom Farm launches its new website with a new concept: a shiitake mushroom log kit “family” with Shiitake Mama at the head of the clan. Shiitake Mama, Shiitake Ma & Pa, Baby ‘Shroomie, Big Boy and the grandad, Shiitake Tree in a Tray are the newly created concepts of Sandra Williams, aka Shiitake Mama, of Lost Creek Mushroom Farm. 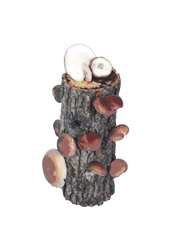 The Shiitake Family of DIY kits are making their grand debut on a new website, http://www.shiitakemushroomlog.com. Logs 10 inches and larger are guaranteed to grow shiitakes and will produce for years. They'll grow indoors like plants, outdoors in shade, or both. Kits include easy-start and detailed instructions and a Lost Creek Mushroom Farm recipe booklet. Prices range from $20 to $90 and include shipping. Baby ‘Shroomie is a 6-inch log for $20. It fruits the same way as the larger kits but is not guaranteed because of shipping costs. The Big Boy is a 12-inch log for $38. Shiitake Tree in a Tray, the granddaddy of Shiitake Mama’s family, is a 14-inch log with its own tray for soaking, fruiting and resting (storing) the log. "The top of the line is the Best Buy, two 14-inch logs in soaking trays shipped to the same address at a substantial savings. They can be alternated for monthly harvests or fruited together for large harvests. “I like to say, get the Best Buy. Give one as a gift and keep one for yourself,” Williams said. The Shiitake Sampler cookbook by Janet Bratkovich has 51 kitchen-tested shiitake recipes. The price is $8.95 when shipped with a log or $10.95 shipped separately. Order online or by phone at 1-800-792-0053. Free brochures are available on request. A portion of sales is donated to Mushrooms for Well Being Foundation: Mushrooms in Ghana Project, building a laboratory to produce spawn (the mushroom seed material). Mushroom farming is a proven course to freedom from poverty, but spawn shortages keep small-scale mushroom farmers from succeeding. The lab will serve West African farmers, most of them women supporting their families and feeding their communities. The website accepts donations. 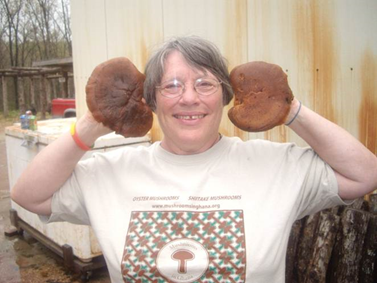 Sandra Williams, Shiitake Mama, says 'SHROOM UP!